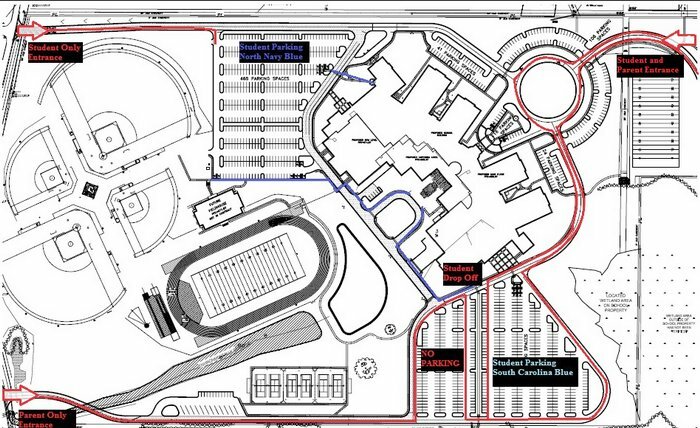 All students should be picked up and dropped off in carlines in the Auditorium parking lot. From County Line Road: Make a left turn at the round-about in front of the school. Students should be dropped off and picked up within the labeled "Drop Zone". At the south end of the parking lot, vehicles should make a left turn looping them to the stop sign, turn right, and continue to the traffic circle to exit. From Burgreen: Use the entrance by the tennis courts. Follow the drive to the sidewalk in front of the auditorium. At the south end of the parking lot, vehicles should make a right turn leading back to the tennis court exit.